Meet Barry Dorman. World War II US Army veteran. Retired professor of electronic engineering. Married for 41 years to Eve, who worked for Boeing during the war, and as a community advocate and housewife after their kids were born. Barry is an avid fisherman and an outdoorsman, Eve a gardener who is still very involved in their community. A few years back, the last of the Dorman children graduated from college and moved out of the house. Barry and Eve are now settling down again at home after traveling Europe and South America, and Barry is back to spending time fishing and camping. The Dormans have two older cars, but don’t really need two any more. Their home only has a single car garage and driveway, and some limited street parking. Eve is a social butterfly, and both hosts (necessitating the extra parking space) and often visits friends or travels to visit family for a weekend. When Barry is gone, Eve has more than enough of a support structure in place to justify eliminating the second car. There is a third family member in the mix. Buck. Buck is Barry’s big, lovable, and dumb Black Lab. All heart and stomach and no brain, Buck accompanies Barry on his outdoor excursions, but otherwise rarely leaves home (or at least walking distance). Barry is looking forward to consolidating and upgrading. While his '66 Townsend Trinidad has been a good car, it is more than showing its age; it’s falling apart. Eve, on the other hand, is not thrilled to be parting with her '74 Ardent Chancellor. Despite being a little over a decade old, Eve’s car still gets looks, and there are those in her gardening circle that would kill to have it. Barry had to concede something in order to get Eve to give up her car. Thus, they both have to agree on the car. Barry’s criteria: Must be able to hold his camping gear and also carry either an inflatable raft and pump or a canoe, depending on where he’s going. Needs to have enough ground clearance and off-road ability to handle forest service roads and the margins thereof where he may have to park. Has to be dependable and should be affordable. It would be nice if it was adaptable to whatever he needs it to do at the time. Eve’s criteria: Doesn’t want anything super-bland or super-edgy. Elegant, if not erring on the side of conservative. She also may demand power steering on a larger vehicle; her Chancellor had it, and as she gets older, it gets harder for her to drive large cars without it. Buck’s criteria: WHERE ARE WE GOING? ARE WE GOING IN THE CAR? CAN I GO IN THE CAR? WHERE ARE WE GOING? OOH, SQUIRREL! HI! I LOVE YOU. ARE WE GOING SOMEWHERE? Flexibility: This is going to be Barry’s wilderness retreat partner (along with his dog, Buck). It is also the around-town runabout for both Barry and Eve. 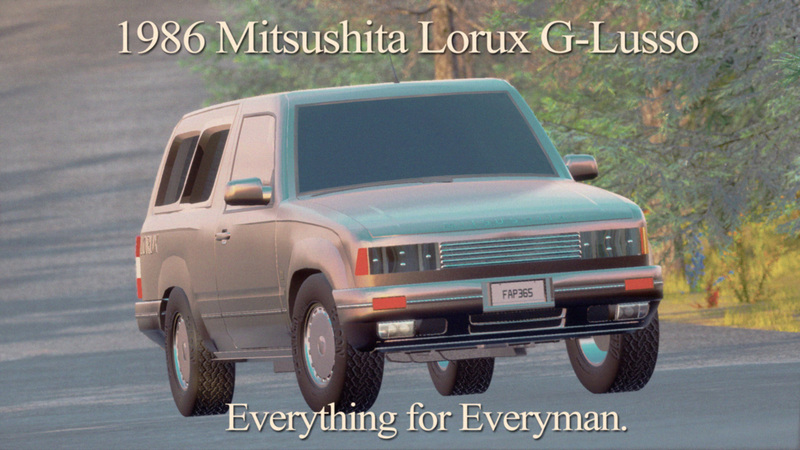 A pure off-road beast isn’t going to cut it, nor will a low-riding sport sedan. It needs to be balanced between the two. 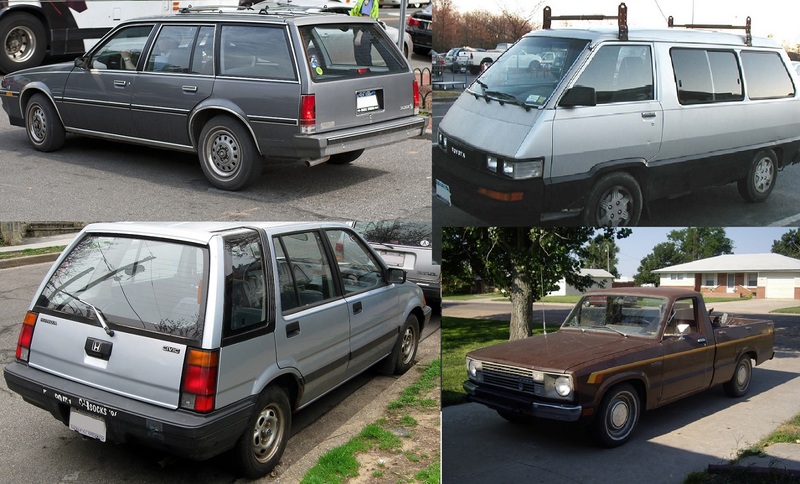 Reliability: This is the last car that Barry intends to buy. Ever. It’s got to be a stalwart machine. Styling: While Barry doesn’t care much about this, his wife does. She is used to driving a swanky car. She’s not going to have one of her own anymore, so she’d prefer not to drive around in a bland, rusty jalopy. On the other hand, she’s also fairly conservative, so won’t like anything overly radical. 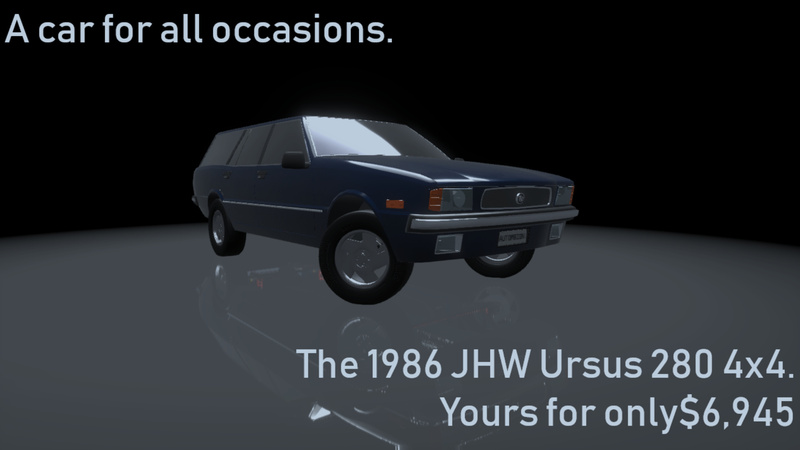 Cost of Ownership: Barry has set a budget of $11000 for the new car (at 0% markup). 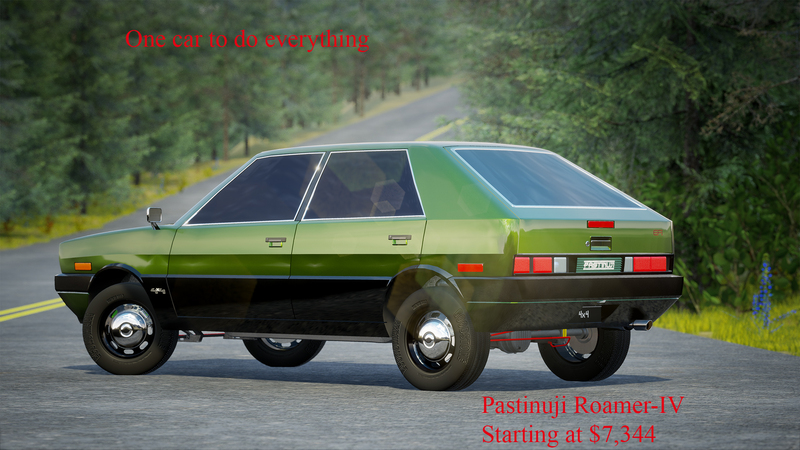 Eve has some savings squirreled away as well, and she will contribute up to $2000 more for a car she really likes, even if it exceeds Barry’s original budget (again, 0 markup). But that extra money’s not a given; you have to cater pretty heavily to her (see Styling above), while not souring Barry on the vehicle. And since Barry likes to do his own basic maintenance, it’s possible to do just that through excessive cost. Economy: Barry can afford to fill up his car, but he has a natural preference to consume less. Premium unleaded is available, but has a 10% price premium, so bear that in mind if you decide to use it. Accessories: You may optionally wish to advertise factory and dealer accessories for your model when you make your pitch. While it’s not required, as the host, I appreciate the ingenuity… and it MIGHT help sway Barry your way in a close battle. An ad is required for all submissions. Also, while not required, it would be nice if your advertisement was priced in 1986 dollars, with an appropriate markup. Trim year must be 1986. Older models are fine as long as it’s been updated for the year they’re buying. Car must meet all applicable US Federal safety and emission standards. That means unleaded fuel and a cat, and Standard 70’s or higher safety equipment. 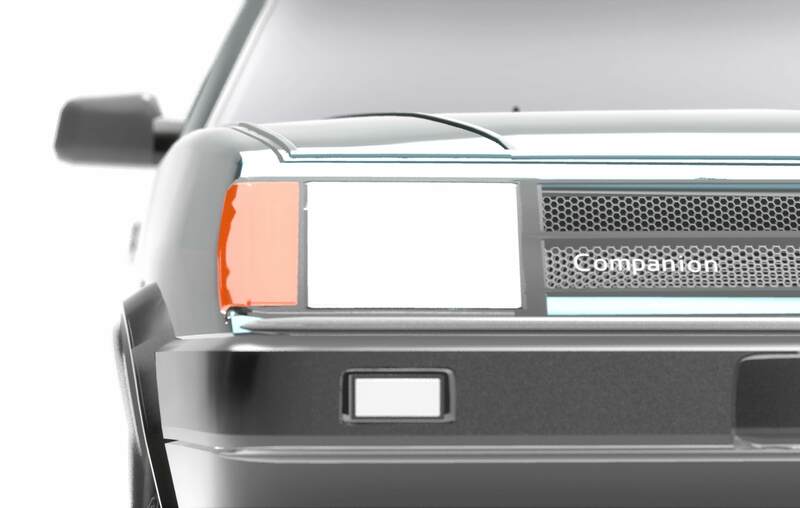 For fixtures that also means at least a driver’s side mirror and front/rear bumpers of some sort. Also, passenger cars (NOT including trucks) are required to have a “Center High Mount Stop Lamp” starting this year, the latest safety regulation. Open beta UE4 for this round. All workshop mods are allowed. This is your first time hosting CSR, but you have come up with a convincing rule set. So… Barry’s looking of a jack-of-all-trades, basically? Edit: there are no PU/ET limits, but I’ll try my best to remain sensible. Removed. I was intending to put some in, but I think that cost limits will be enough. Not entirely. If you read into it, there’s some heavily weighted stuff and some things he has little or no concern for. There’s a wide variety of ways to go with this, but some common design philosophy as well. It’s up to you to find it, of course. I love the work you put into this everyday story. 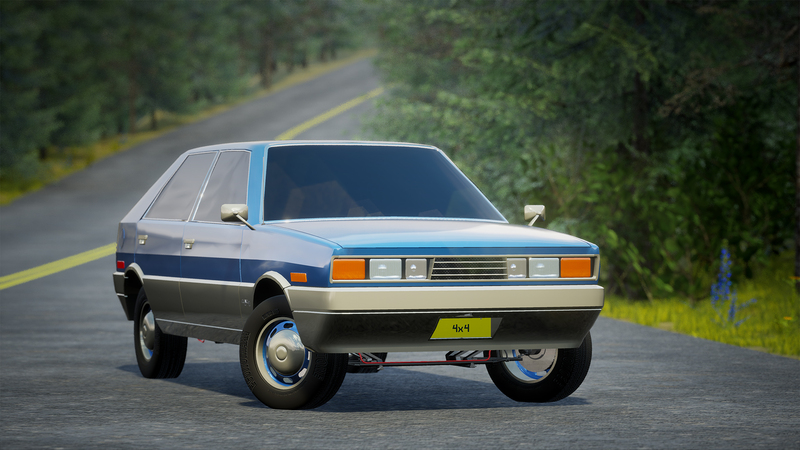 I will consider trying to make a car for this. Screw everything else. I’m making the perfect car for Buck the Lab. I tried this, and thought I had succeeded. Then I looked at the market price and asked myself if I was barking mad. Maybe yes, woof, but in a Lord Flashheart way and not in a good boy Buck way when it comes to judging criteria. Man, the dog reference really threw a bone at you, didn’t it? Oh God, seems I caught it too, that’s unfortunate. All doggy business aside, this challenge gets me curious. My favorite motoring era, and plenty of ways to tackle this… If I want to earn my CSR stripes, this is as good as any of a place to start. Basically, our cars need to go home and be family men, right? OK. I’ll PM you the .car-file then I guess, and then everything is OK? EFI Inline-Six OHC 1.6L mated to an electrically controlled Four-Speed auto with torque converter lockup. Manual locking hubs for difficult Terran. 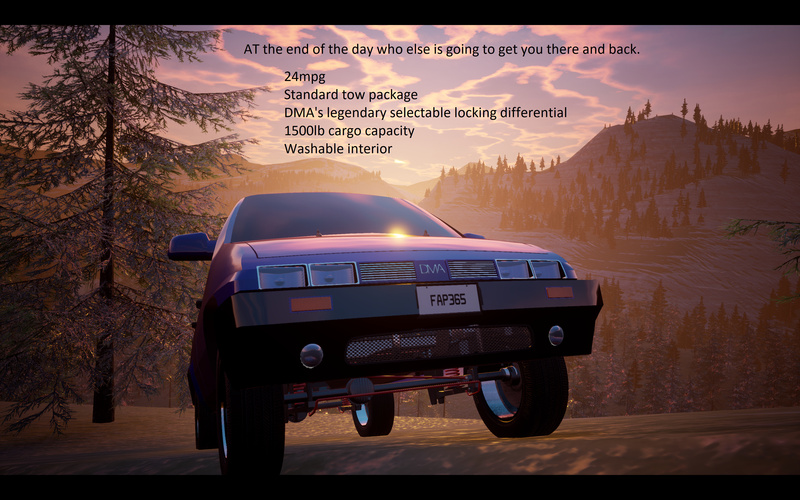 Don’t think you have to have a truck to go everywhere, re-think your limitations with the Roamer-IV. With a towing capacity of 3,796lbs (1722kg) and a load capacity of 940lbs (426kg). No matter what you decide to carry along with you, the Roamer-IV can handle it. You receive this letter and brochure because you were erroneously sent a promotional card for our new Companion Wagon 1.7 that regrettably contains a printing error. We apologize for the incorrect information that has appeared on this particular batch of cards. 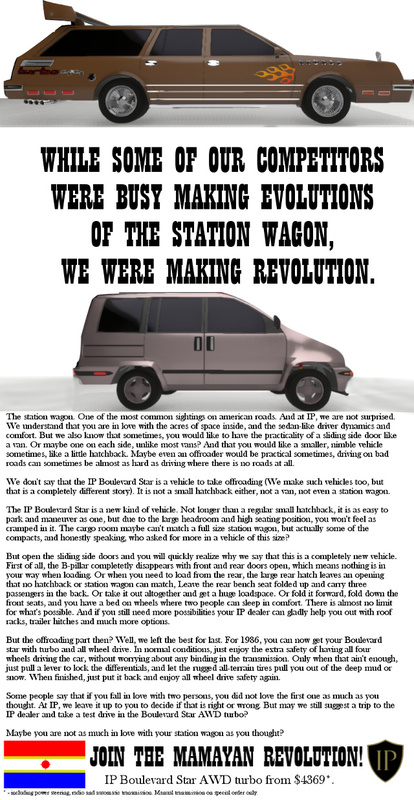 And we assure you that our cars, including the new Companion Wagon 1.7 will also turn Westward. The reference to “East” on the promotional card concerned is a typo and refers to our patented Easy-to-DriveTM advanced automatic transmission system, which, we may add, is specifically adapted to select between cruise-mode; city-mode; and MPB-mode (“mud-, puddle- and bumps”). 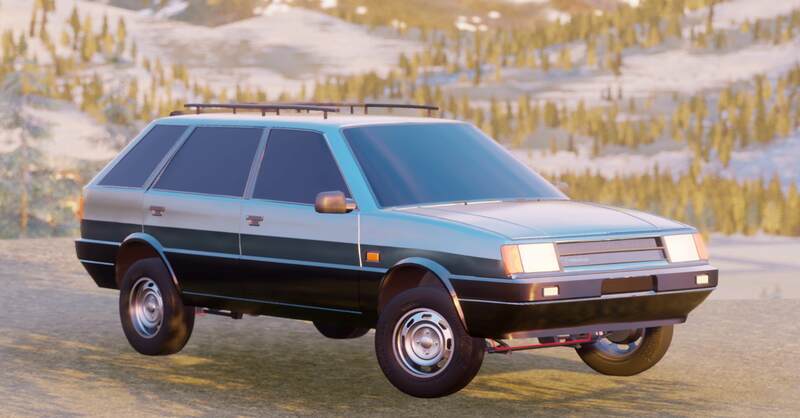 The brand new wagon version of the PMI Companion has appeared on the market, currently being offered with a state-of-the-art but highly reliable 1.7 litre engine (future engine options are planned for 1988 model year). 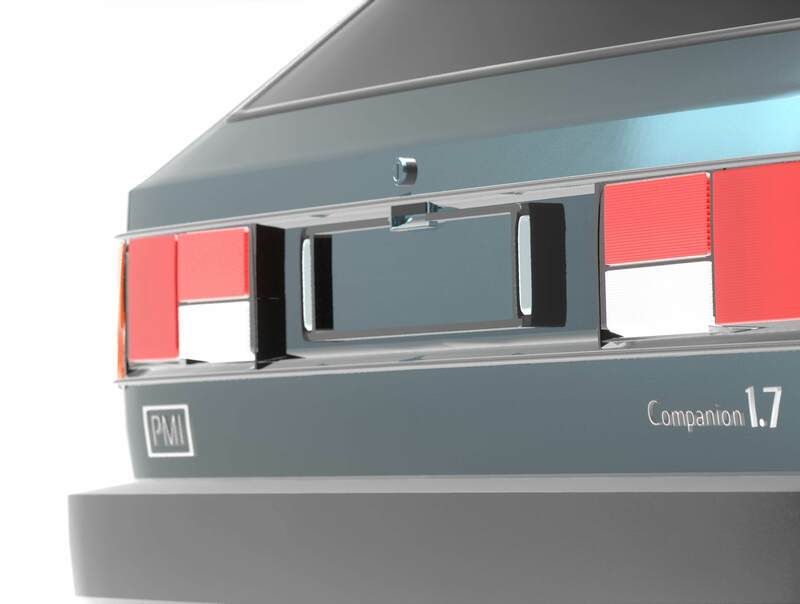 The PMI Companion Wagon 1.7 aims to be a modern and straightforward car, offering everyday transport and utility in a stylish and comfortable fashion. We offer as standard central locking for the 4 doors, two front cup holders and two mirrored sun visors - the missus can do her rearrange her make up after her commute to work or to her many social events. We never forget our female drivers, who will certainly enjoy our earlier advanced automatic transmission system backed-up by power steering, allowing for nimble city manoeuvring. Gentlemen and outdoor-men, rejoice in the fact that this same Easy-to-DriveTM system allows this lightweight but sturdy and guaranteed corrosion resistant vehicle to tackle the unpaved roads towards pastures, hunting or camping grounds. This may not be an off-road rock crawler, but with the front-wheel drive system coupled with performant back-suspension and the manual selection mode for the transmission, PMI guarantees you the Companion will be your best friend on every backroad. PMI admits it might lie there, but only because instead man’s true best friend might be sitting next to you or in the spacious and modular rear (the rear seats are foldable and completely removable) of the car during those trips. In this last scenario we bear good news, as PMI has developed a revolutionary system to refresh and cool the air inside the car, without unreliable and leaking aircon. Your pet will be panting of enthousiasm only in the PMI Companion Wagon 1.7. The interior is as durable as the exterior and allows you store ample shopping, hunting or fishing supplies, camping or beach equipment without any issue. The external roofrack is also modular and can be adapted in width and breath to accommodate extra luggage, skies, canoes, bikes, surf planks or other. The 1.7 PMI engine is from our European sister company and focusses on reliability, low speed driving and low fuel consumption. PMI US assures you the powerplant is freedom-approved, yet trust-worthy and economical. The price listed in our promotional card is not printing error we assure you, and remains at a remarkable $ 5905, for the perfect car for he or she, in and outside of the city. To further excuse for the confusion caused by our printing error, PMI cordially invites you to present this voucher when buying a PMI Companion Wagon 1.7 to receive one of our 4 special trims for free. 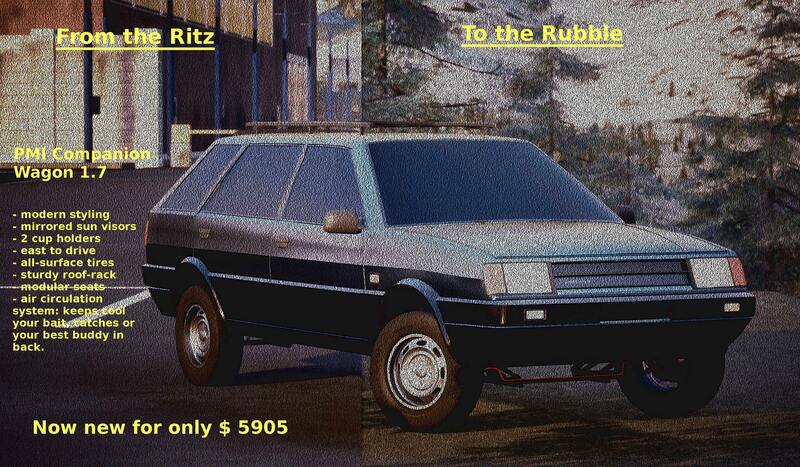 The Ritz or the Rubble - or both. The choice is yours. PMI Companion Wagon 1.7 is your choice. Double folded advert from 1986. $6,100 back then. Not a bad price at all considering what you get.